If you are visiting our pages through word of mouth of our customers, you probably already know our quality. If you wish to become our clients for the first time, we hope that you will soon suggest the Hotel Turismo to your friends. 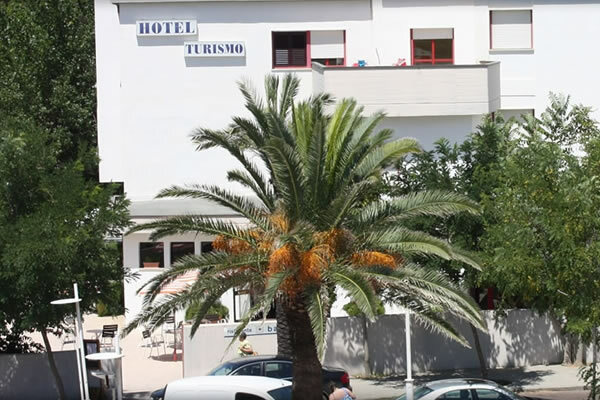 The Hotel Turismo offers its guests many services:Reception 24/7, Bilingual Staff (Italian and English), Restaurant, Private beach, Tv Area with satellite, Lift, Major Credit Cards accepted, Room Service, Telephone Service, Fax Service, Safe - keeping, Wi-Fi Internet, Internet corner in the living area, Shuttle Service from and to the train station, Secure parking (in agreement with a guaranteed parking), Excursions and guided tours (affiliated with professionals), Sports (in agreement with sport facilities). All the 61 spacious and comfortable rooms are equipped with: Bathroom with shower, Air Conditioning, Minibar, Satellite TV with Sky Vision Gold, phone, Wi-Fi Internet, hairdryer. The floors access is facilitated by a lift. Integrated in the hotel the Ristorante Turismo offers a fixed price menu (€ 20.00 for lunch or dinner) istead of a corresponding order "a la carte" normally more expensive. It 's another of the many reasons to rely on the Hotel Turismo all your holiday plan, more than the exclusive accommodation. In all areas of the hotel is available free Wi-Fi internet connection. Stay connected to the digital world staying in our hotel. The Hotel Turismo accepts the following credit cards: Visa, Diners, American Express, MasterCard, Bank card, JCB / Maestro. Please, contact us if you possess other credit cards, we will inform you in advance if our circuit card accepts them. To withdraw cash, the Lido di Metaponto has some ATMs located for easy access. Metaponto Railway Station is located about 2.7 km away from the Hotel Turismo. If you wish to be picked up at the station by a shuttle to come to our hotel, please fill out this form. The rate for the service is € 3.00 per person including luggage. Metaponto is located in a strategic position to the extraordinary touristic attractions: The Antiquarium of Metaponto, with the Tavole Palatine, The National Archaeological Museum Siritide of Policoro, The National Archaeological Museum of Magna Grecia of Taranto, The Sassi of Matera and the Natural Archaeological Park of Rock-hewn Churches of Matera. These are only some sights, other than numerous landscape, cultural and food and wine resources. To facilitate the guests approach with the territory, we have relied on professional partners who offer guided tours and excursions. Those who wish to participate in guided tours can book directly through our reception, by bus directly from the hotel... you couldn't ask for more! Hotel Turismo Metaponto collaborates with Tour Matera. In Metaponto you can complete a pleasant stay practicing numerous sports: Beach Volleyball (directly on the sandy shore of our private beach), Golf, Jogging, Football and Soccer, Riding school, Tennis, Clay Pigeon Shooting, Swimming Pool. Hotel Turismo has signed agreements with the major facilities that offer these services, you can book and pay directly in our hotel to make use.